In Asia, spot styrene costs continued to record increases last week as prices indicated three digit hikes on a week over week basis. 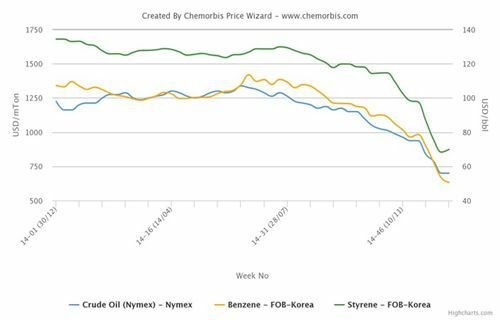 As a result of these styrene hikes, Asian PS offers given to the Mediterranean markets, including Egypt and Turkey, soared while Asian PS markets embraced more modest hike amounts, according to ChemOrbis. 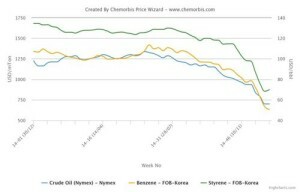 Looking at styrene costs, which are supported by maintenance shutdowns in South Korea, they recorded around $125/ton increases on a week over week basis. When comparing styrene prices with the beginning of April, they indicate even larger gains of $220/ton while the current styrene costs are $275/ton above early March levels. In plant news, LG Chem had shut their 180,000 tons/year Daesan plant in South Korea for a month long maintenance in March while they also shut their 500,000 tons/year Yeosu plant in April, again for a month long maintenance. Lotte Chemical shut their 580,000 tons/year South Korean styrene plant on March 20 for 3 weeks turnaround while Samsung Total’s 280,000 tons/year styrene plant in South Korea, Tianjin Dagu Chemical’s 500,000 tons/year Chinese styrene plant and Idemitsu Kosan’s 210,000 tons/year styrene plant in Japan will also be shut for maintenance work during April and May. Samsung Total, Tianjin Dagu Chemical and Idemitsu Kosan’s shutdowns will last around 30 to 45 days. Higher styrene costs, supported by plant shutdowns and higher oil prices, which rose on the back of geopolitical tension in Yemen at the end of last week, pulled PS prices higher across the global markets, despite still weakly performing demand. However, Asian PS markets are not recording hikes as rapidly and as large as the Turkish and Egyptian markets. In Turkey, Indian and Pakistani PS offers recorded $75-100/ton hikes on the week while South Korean origin soared by $155-175/ton. Meanwhile, when comparing the current PS offers with late March levels, dutiable PS origins indicate $200/ton increases while South Korean origin represents $265-275/ton hikes. Apart from the significantly higher styrene costs, Asian PS offers given to the Turkish market are also propped up by the very strong European market, which is also supported by plant shutdowns and higher costs. However, Turkish players are taking their time to respond to these higher levels as very few of them are interested in making fresh purchases. Meanwhile, Egypt’s PS market also responded very rapidly to the styrene hikes in Asia. Import Far Eastern PS offers gained $140-180/ton increases on a week over week basis while Southeast Asian prices moved up by $110-120/ton over the same period. However, like in Turkey, buying interest remains thin in this market, too, although the high season for PS applications is approaching. Despite the slow demand, players mostly pronounce their further increase expectations for the days ahead based on the firmer styrene costs. Coming to the Asian markets, the increase on PS prices are rather modest, according to ChemOrbis. Import Asian GPPS prices were reported $20-60/ton firmer while HIPS prices were reported $20-80/ton higher on CIF Southeast Asia basis at the end of last week. Despite these relatively smaller hikes, Asian players are still mostly out of the market. A converter operating in the Philippines said, “We see good end product demand but due to our sufficient stocks, we are not interested in making fresh purchases.” Some players, pointing to the fact that the maintenance season will end in May, comment that the high PS prices may prove not to be sustainable. Nevertheless, considering the fact that the Asian producers have already issued large hikes to other global markets and their higher styrene costs, Asian markets may see some additional increases ahead.